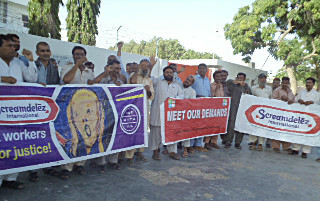 Mondelez Pakistan has informed the government that the vast majority of those who make its products are "outsiders" beyond the scope of legal industrial relations protection, and that those who challenge this abuse should be stripped of their rights. At Mondelez Pakistan 53 permanent workers and over 350 contract workers (150 of them in 'core' production positions) produce Cadbury-branded products. Management has consistently refused to accept the union's demand for negotiations on the status of the agency workers, asserting that the union has no right to even raise such demands. The company petitioned for a lockout when the union filed for strike notice for April 1. Now, during the mandatory conciliation period during which there can be neither strike nor lockout, the company has petitioned the National Industrial Relations Commission to bar the union from "unfair labour practices" such as holding public demonstrations, "slogan raising" or conducting union activities at the factory on the grounds that the vast majority of its workforce are "outsiders" whose interests the union may not advocate! The union rejects these arrogant attacks on fundamental rights. On May 4, with the support of the national foodworkers federation, the union demonstrated outside the factory gates - and will be stepping up its campaign in the weeks ahead.